As in all her previous work, you'll find Shem Creek to be compulsively readable, irreverent but warm and blazingly authenticand you’ll dread reaching the last page. It is her vivid writing, colorful characters and rich narrative that have made Dorothea Benton Frank one of our nation’s greatest storytellers. C an I just tell you why I am so deliriously happy to drive all through the night from New Jersey to South Carolina? Here we are, boxed in between this wall of eighteen wheelers on our left and right, in front and behind, in this little pocket of flying road, racing down I-95 at seventy-six miles an hour. My daughters are asleep beside me and in the backseat. I don't care that it's pouring rain. I don't care that it's dark. On another night, I would terrified out of my skin by the blasting of horns. But not tonight. Let me tell you something. These trucks are like huge guardian angels rushing us to safety and the rain is washing us clean. Life has been a little rough around the edges and it was time to break out. Yeah. A little rough would be one way of understating it. Oh, eventually you'll hear the whole story, because this is a long ride and there ain't much to do besides tell secrets and think about life. Thinking about life is what I had been doing for one very long time. I finally decided to quit the thinking nonsense and do something. I mean, I was even driving myself crazy from my own whining. Then I came to this conclusion. You don't like your life? Go get another one and shut the heck up already, right? Look, I know I'm not the only single parent in the world. And I know I'm not the only one who's tight for money all the time, okay? And, I might not be the biggest gambler you ever met, but I know when it's time to change the scenery and if you don't do it when you feel the urge, you might be blowing off the last life raft that ever floats your way. It's probably worth noting that I waited to change the scenery until I went digging for my mascara in Gracie's makeup bag (my fifteen year-old daughter, thank you), and I found birth control pills, some other unidentifiable pills, and a baggie of pot. Then, I hemmed and hawed around until I found Lindsey weeping over her - she's five feet five inches tall and weighs one hundred and twenty pounds, the same as Gracie. She doesn't even have a freckle. Her date for the prom told her he couldn't go with her, that she was too fat. She was standing naked in front of the full-length mirror, sobbing and reading Sylvia Plath aloud - remember her? She's the poet who stuck her head in the oven and killed herself. The final straw was the romantic dinner I had with Louie Provost at Epernay when his wife, Cherry, showed up to introduce herself. Um, didn't know there was a wife? Thanks, Louie. Can't have dinner there anymore. 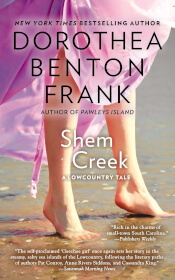 Dorothea Benton Frank, author of the bestselling Isle of Palms, returns to South Carolina's atmospheric Lowcountry for another warm, engaging story of love and second chances. Single parent Linda Breland ditches a dead-end job and life in New Jersey to move back home to Mt. Pleasant and start a new life for herself and her teenage daughters. ("Look, if New Jersey had wanted us, it would have given us a reason to stay. It didn't.") The work she finds -- manager of a restaurant on Shem Creek -- introduces her to its owner, Brad Jackson, a man living out his own second chance. Frank takes her time unfurling the plot and developing her characters -- the adjustment of the Breland family to the South, the friendships among the people at the restaurant, and, of course, the growing romance between Brad and Linda -- and the result is a delightful and poignant read, filled with humor and the celebration of life.